RAF bomber command raid reports for 186 Squadron on the night of 13th January 1945. 186 were based at Stradishall as part of 3 Group and flew Lancasters on a sortie to attack the railway yards at Saarbrucken. Four sheets. 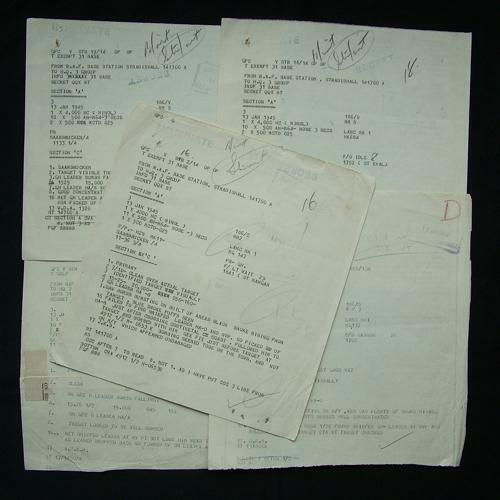 These original reports note the detail of the sortie, each giving the pilot of the aircraft, bomb load and observations made during the raid. For example one relates the detail of Flying Officer Idle's aircraft, a Lancaster Mk.1 code HK684. They were carrying 1 x 4,000lb HC (high capacity) bomb, 10 x 500lb AN-M64 (American bomb type) and 2 x 500lb MCTD bombs. It notes 6 - 7/10 cloud cover, that the target could be visually identified and that bombs were seen to be bursting in good concentration. Also states that the target was covered in smoke so bombing results were not seen. The other reports are similar but the aircraft have differing bomb loads. Most are typed undercopies on thin paper and have annotations in pencil. They also have stamps such as 'Immediate', Secret' and RAF Station Stradishall 'Signals Section' dated 17 Jan. 1945. Interesting original documents relating to a bomber command sortie over Germany during the last months of the war. Stock code P22873-90.